[01 Jan 2014] As part of our commitment to serve all our shoppers with the utmost care and high-quality support, we have moved on to using a enterprise-grade support system. In addition, our site now offers more varied savings and drastic speed improvements to make your shopping experience a better one. As we move on to 2014, Savevy will have better and richer features to bring bigger and better savings to our shoppers. [03 May 2013] Mother's Day is round the corner and we want to help shoppers who want to buy their mum that special something and not break the bank at the same time. That is why we have provided the best Mother's Day coupons for this May 2013 right here on Savevy. So go ahead, give your mum a day she will never forget. [29 Nov 2012] In an effort to promote a more family-friendly shopping experience that is suitable for teens and kids, Savevy is happy to announce that it has removed adult stores and other inappropriate coupons from the site. In addition, the Savevy team is monitoring site activity for any occurrence of inappropriate coupons and remove them once they appear. Shoppers can play a part by contacting the Savevy team when they find any inappropriate materials on the site to improve the overall family shopping experience. Or they can always feedback the team with any improvements they would like. [01 Nov 2012] Mobile coupons are getting bigger (https://bit.ly/wDuuoA) as more shoppers shop on the go on their mobile devices like their smartphones, tablets and gadgets. 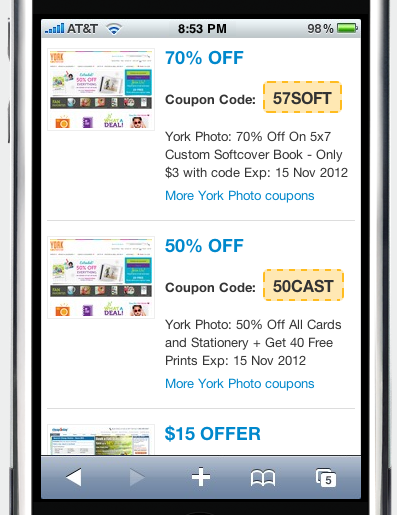 And shoppers will want a quick and easy mobile experience when accessing coupon websites. To keep up with this mobile trend, Savevy has released an update to its website so that online shoppers can enjoy a complete shopping experience on their mobile devices which is just as superior as a desktop counterpart. Using responsive design and device detection to deliver its coupons and discounts to shoppers, Savevy is a great solution to mobile shoppers. In addition, speed is a main priority and a key goal for Savevy to deliver a snappy web experience. And being one of the pioneers in the mobile coupon codes space, Savevy will be asking for feedback from mobile shoppers. Visit Savevy today on your mobile device to enjoy a great new shopping experience. [28 Oct 2012] Coupon codes help to promote spending among consumers online as found by a study from Whaleshark Media (https://bit.ly/o6b9hC) And they are only set to grow bigger as the e-commerce market expands. That's why Savevy has been launched to provide premium and trusted coupon codes to online shoppers. With coupons from big-name brands like Amazon, Kohls, and Target to small indie stores like Etsy and BigCartel, Savevy is looking to expand its collection of coupon codes, discounts and offers to improve the shopping experience by finding deep discounts, exclusive coupons and great free shipping deals. And what makes Savevy extraordinary is that Savevy aims to be a social platform for shoppers to rate coupons, evaluate merchants and interact with each others. In addition, Savevy is using social platforms like Twitter and Facebook to connect with shoppers to share great coupons. Visit Savevy today for the best premium and trusted coupon codes. This is where we publish the latest news and updates regarding Savevy. For media enquires or questions, please contact us using our feedback form.